The "Mission Ridge One-Room School"
It was originally located about two miles northeast of the Farm Museum grounds on a ridge known as Mission Ridge, hence the name. It was built about 1870. Soon after West Virginia became a state, which was on June 20th, 1863, the state legislature passed a bill making it mandatory for the various counties of the state to finance the construction and operation of schools. Before becoming a state, while this area was still part of Virginia, the Virginia legislature had passed a bill giving various counties permission to levy for the operation and construction of free schools. However, very few counties or districts in West Virginia took advantage of this particular legislation. So, after West Virginia became a state, the legislature passed a bill making it mandatory for counties to operate free schools. Soon, school buildings began to be built throughout the state. 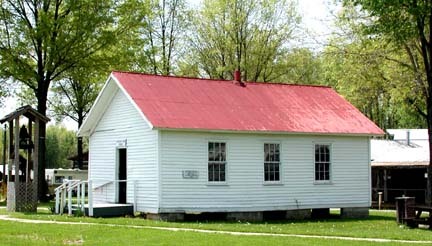 The one-room school was an important institution in the rural communities of West Virginia for a number of years. 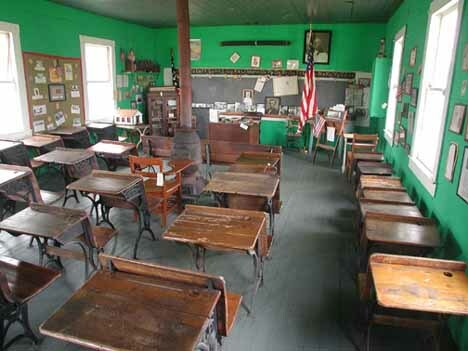 One-room schools were quite common in all counties of West Virginia until a few years after World War II. At that time, many of the counties began a consolidation program. Roads were improved so that school buses could travel in all kinds of weather. Thus, many of the one-room schools were closed, and the students were brought to a central school. The one-room school had one teacher who was responsible for grades one through eight. These one-room schools usually had from 20 to 40 children. A school day was 9 a.m. to 4 p.m., with a morning and an afternoon recess of 15 minutes each and an hour period for lunch. In those days, there were no TV's or radios to watch or listen to, so older boys and girls often came to school even though they had graduated from the eighth grade.